Your senses have not been misleading you– we’re thrilled to say that The Beguiling is growing! Over the course of the next year we will be expanding our College St location from a space a little bit smaller than our old location to one several times larger– same great taste, even more filling. We’ll announce more concrete things as they approach, but our initial expansion should be open to the public very soon so stop on by and maybe you’ll get to see for yourself! 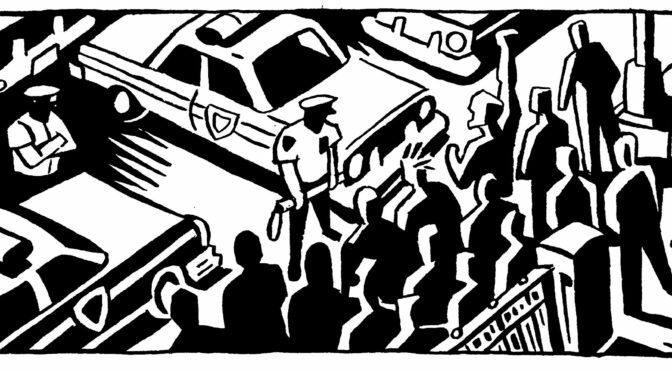 The Beguiling is pleased to present, in conjunction with Suspect Video and Horror-Rama, a conversation with underground comics artist Mike Diana! Underground cartoonist, self publisher of controversial zines full of sexuality and violence, Diana has the distinction of being the first person to receive a criminal conviction in the United States for artistic obscenity. 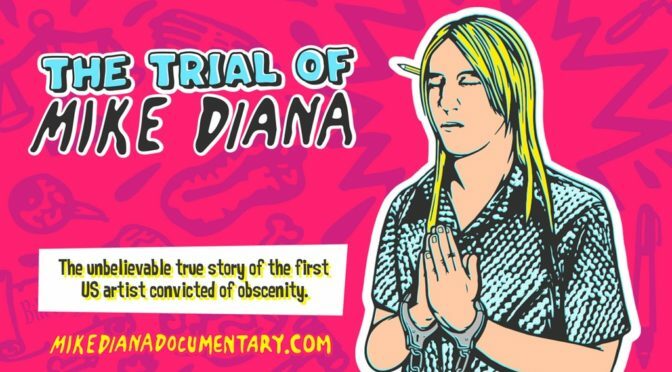 A documentary of Diana’s case entitled “The Trial of Mike Diana” is being made and will be released in the near future. This event will be held in The Beguiling (319 College) Sunday, November 5th at 6:00pm. 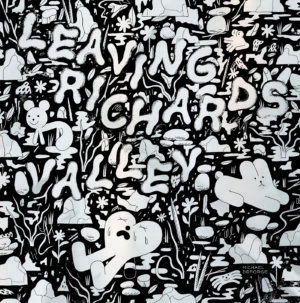 Following the conversation will be a chance for a Q&A and signing with the artist. We’ve just added this absolutely breathtaking piece by Mahendra Singh to the art store! 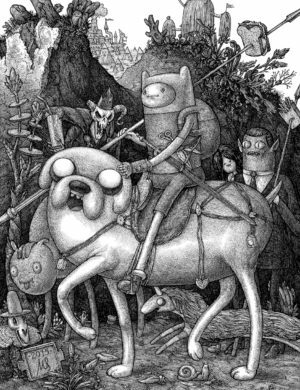 This is the original art for an Adventure Time licensed poster issued by the now-defunct Cartoon Network Collective, a parody of Albrecht Dürer’s “The Knight, Death and the Devil”. .One of the last pieces of Adventure Time original art that will ever be available, and absolutely BEAUTIFUL. Follow the link up top to our art store for more information! 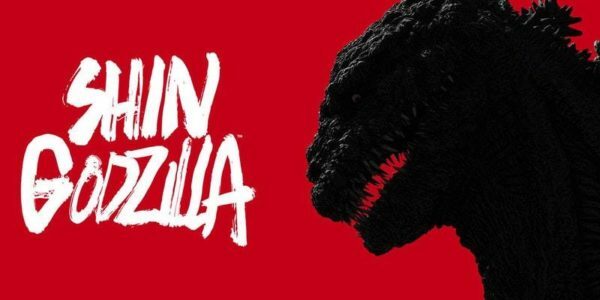 Make way for the ultimate homage to one of the most enduring legends of the big screen-Godzilla! The King of the Monsters is back in Tokyo for a city-crushing crusade that speaks to the very roots of the world-renowned franchise. 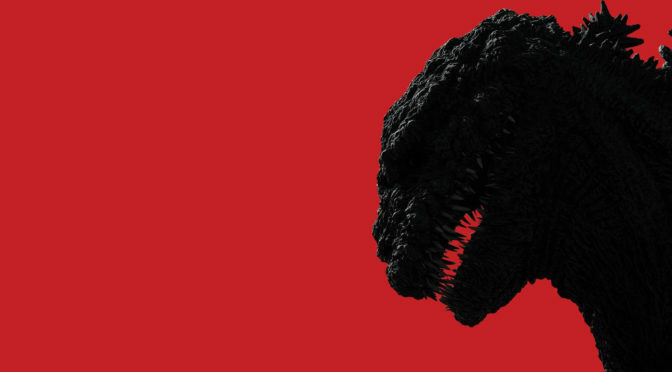 Directed by Hideaki Anno, creator or Neon Genesis Evangelion, Shin Godzilla took home SEVEN awards at the 40th Japan Academy Prize, including Best Picture! The Beguiling will have an awesome merch table on display, and a prize will be raffled off to a lucky winner! 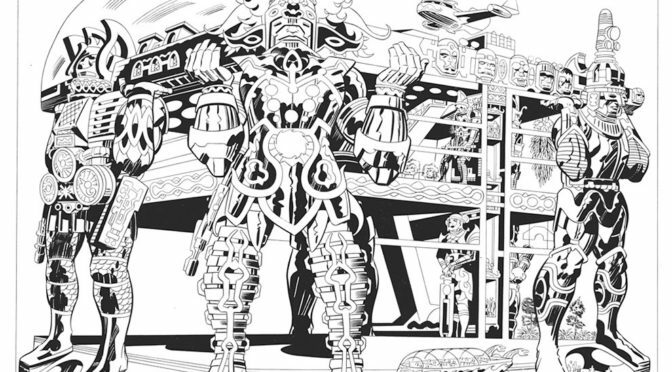 Jack Kirby LORD OF LIGHT Print Auction! 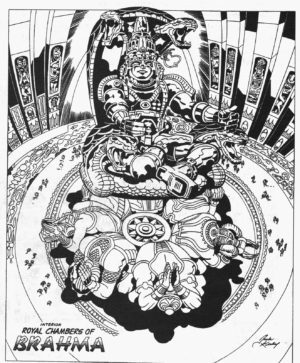 We recently unearthed a set of 10 Jack Kirby LORD OF LIGHT prints from the estate of a film-maker who was active in Toronto in the 1970s/80s!! This was an amazing find, and we’re excited to be able to offer them for sale! There are more details and pictures over on the ebay auction HERE! THIS ONE SUMMER Original Art Charity Auction for Banned Books Week! 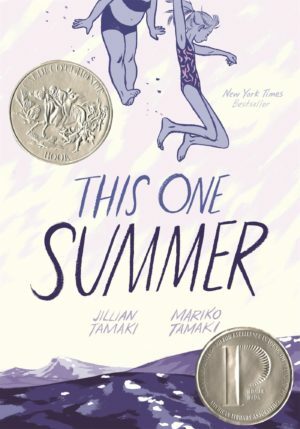 To mark Banned Books Week, Jillian Tamaki & The Beguiling are pleased to announce this chance to purchase original art from 2016’s most challenged book in U.S libraries THIS ONE SUMMER, with all proceeds being donated to UNICEF Emergency Fund. 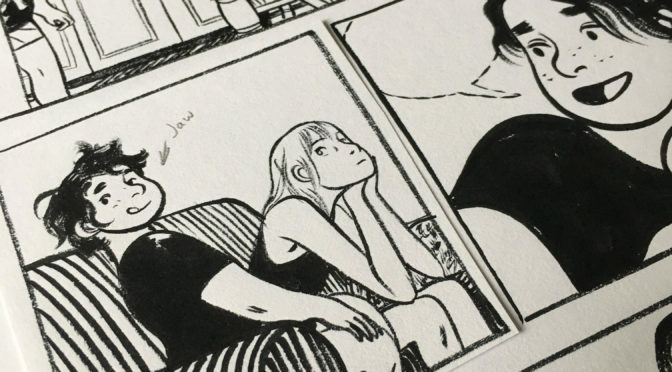 While many pieces from This One Summer are available year-round for sale on our original art store, these pages have never previously been posted for sale, and were chosen specifically by Jillian Tamaki to auction and raise money for the UNICEF Emergency Fund. Don’t miss out on this unique opportunity! The auction is live NOW over on EBAY for the next week! Thanks to Jillian for approaching us about taking part in helping such a great cause! Double Book Launch: Stephanie Cooke & Emmanuelle Chateauneuf at Page & Panel! 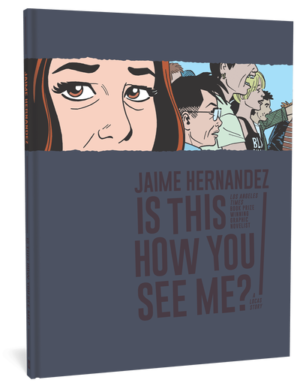 Join us for a Meet and Great with comics creators Stephanie Cooke & Emmanuelle Chateauneuf as they launch new comics and books at Page & Panel: The TCAF Shop! Stephanie Cooke is the Editor in Chief of Rogues Portal and host of the Comicsbound and The Missfits podcast She is also a writer and contributor to The Secret Loves of Geek Girls and is formerly of JoBlo.com, Talking Comics, Agents of Geek, Word of the Nerd and more. Geek quiz mistress and crazy cat lady (or Khatleesi). Stephanie Cooke is a Toronto based writer and editor. Her writing credits include “Huck” (Millarworld Annual), “Lungarella (Secret Loves of Geek Girls), “Behind Enemy Linens” (BLOCKED Anthology), “Home and Country” (Toronto Comics Anthology), “Lord of the LiveJournals” (Secret Loves of Geek Girls Redux) and more. 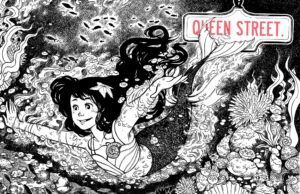 Emmanuelle Chateauneuf is making her graphic novel debut QUEEN STREET, through Chapterhouse Books. 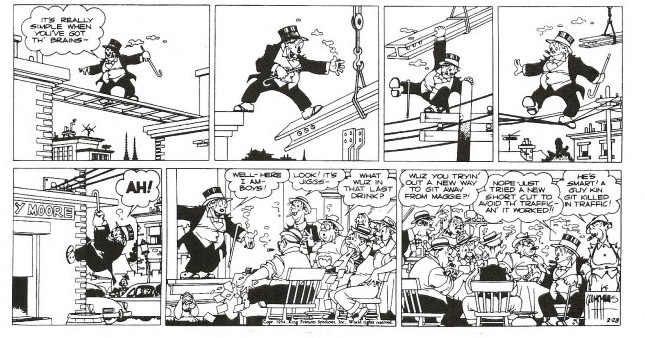 Her previous work has appeared in The Feathertale Review, Captain Canuck, her online comic strip series, ‘The Daily Comics’. The MILLARWORLD ANNUAL is back! After an international hunt for the world’s best new comic book talent, a fresh crop of creators are taking on MARK MILLAR’S hit characters. With stories from HUCK to SUPERIOR, EMPRESS to NEMESIS, the second ANNUAL is an instant collector’s item. Meet Aimee– an overworked junior partner at a prestigious law firm in Manila, Philippines. One storybook romance, four back-to-back flights, and nine years later, in the small of mind but big in spirit town, Sault Ste. Marie, Ontario, Canada, she now lives; still overworked. 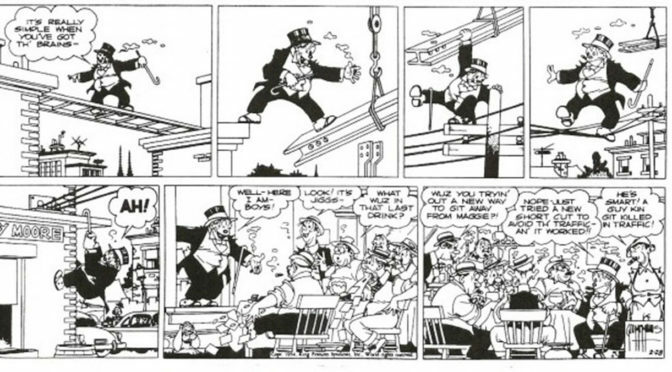 But as a lower class serial-full-timer and mother to her only child, Melodie– an intelligent and eccentric seven-year-old, whose big personality is only rivaled by her even bigger imagination. Join them and a cast of unlikely characters just as confused and lost, as they stumble blindly for twelve consecutive hours through the beautifully disastrous comedy of Life. Don’t miss this breakout semi-autobiographical slice of life tale from Emmanuelle Chateauneuf, depicting the modern world as seen through the eyes of a woman and a girl, navigating the meanings of family and purpose in the complexities of simply being alive. 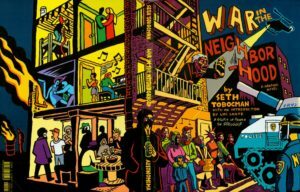 September 23rd, acclaimed graphic novelist Seth Tobocman will present War in the Neighbourhood, a classic study of anti-gentrification activism in New York, recently re-issued by Ad Astra Comix. At a time when gentrification threatens to change the face of Kensington Market, and other areas of Toronto which have traditionally been home to those on the margins, this story is more important for us than ever. We’ll also hear from some local activists (details to be confirmed). We’re very excited about this event, and we hope you can join us! Part of the Faith, Art and Activism festival, an annual collaboration between St Stephen’s, the Trinity College Chaplaincy, and the Student Christian Movement. We are co-sponsoring this event with St. Stephen-in-the-Fields! 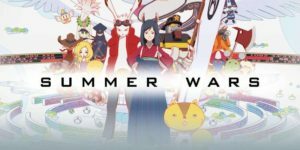 SUMMER WARS: Anime @ The Revue Sept 26th! A modern-day anime classic! Kenji is a teenage math prodigy recruited by his secret crush Natsuki for the ultimate summer job – passing himself off as Natsuki’s boyfriend for four days during her grandmother’s 90th birthday celebration. But when Kenji solves a 2,056 digit math riddle sent to his cell phone, he unwittingly breaches the security barricade protecting Oz, a globe-spanning virtual world where millions of people and governments interact through their avatars, handling everything from online shopping and traffic control to national defense and nuclear launch codes. Join us at 6:15PM! We’ll have merch on sale, and prizes courtesy The Beguiling and TCAF Shop!